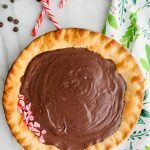 This Peppermint Mocha Pie is made with only 9 easy ingredients! It’s silky, extra chocolatey and no bake! 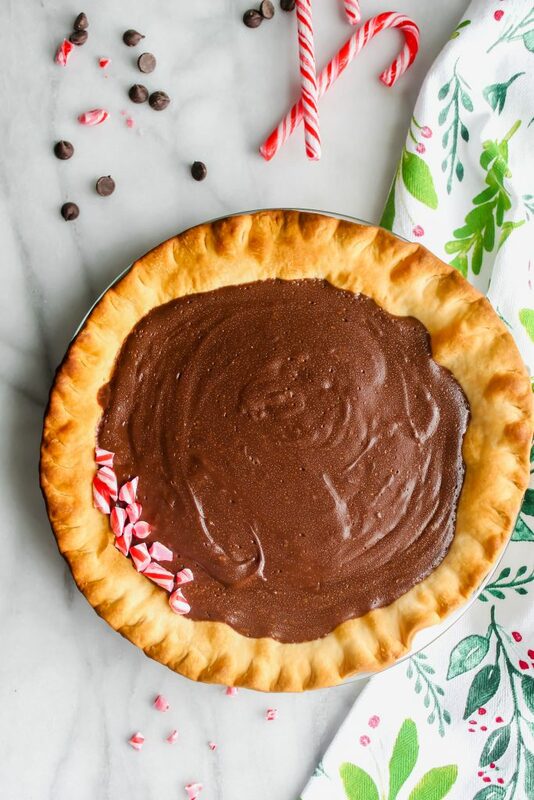 Your favorite holiday coffee drink made into a pie! What could be better?! Thanks to our friends at WeWalka for sponsoring this recipe! Alright, y’all, I need to get something off of my chest. Pies are for YEAR ROUND consumption! Not just Thanksgiving! I feel like people go crazy over pies for one month out of the year, but once December rolls around, it’s cookies or nothing. I personally love pie anytime of the year. Or month. Or day. Or time. Yup. 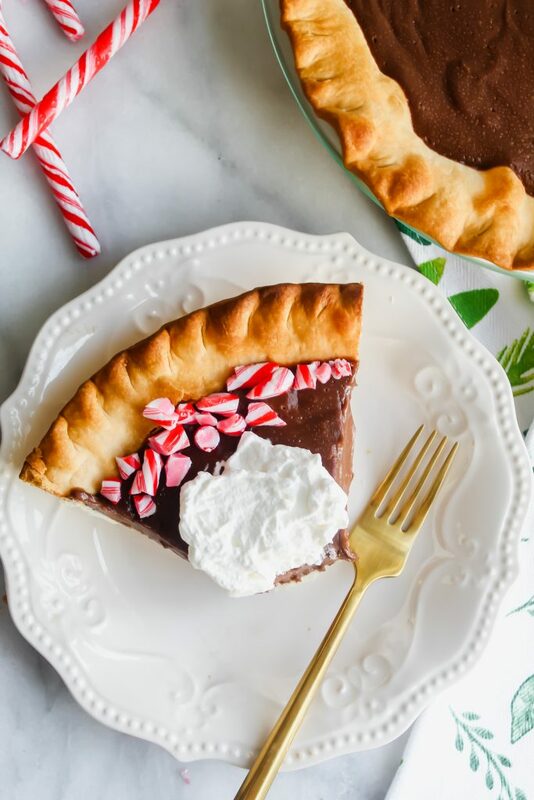 I especially love this Peppermint Mocha Pie! Y’all!!! First of all, it’s no bake which makes my non-baker heart very happy. From the flaky crust, to the rich chocolate filling, to the peppermint flavor, to the whipped cream on top. It’s just straight up Christmas in pie mode. I’ve loved the Wewalka brand for a long time now. I’ve used their pre-made pizza crusts for over a year now – I even used their pizza crust for my Peach BBQ Chicken Pizza post this past summer! So as the holiday season quickly crept upon us, it was brought to my attention that they also have pie crusts! YASSSS! Listen, I know some people really really prefer homemade pie crust and I’m totally okay with that. However, this is the first pre-made pie crust that I’ve tasted that actually TASTES homemade. It’s a European style dough which means it’s extra thick! It’s also flaky, buttery, and completely lard free! Lastly, you can understand and read all of the ingredients which is super important to me when I’m buying at the grocery store. So, to say the least, I was instantly sold on this pie crust. 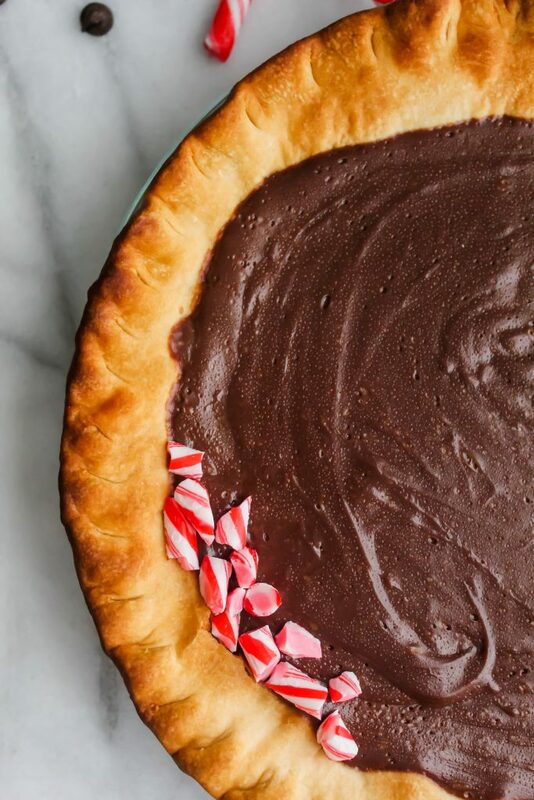 I knew this crust would make the perfect companion to this Peppermint Mocha Pie. 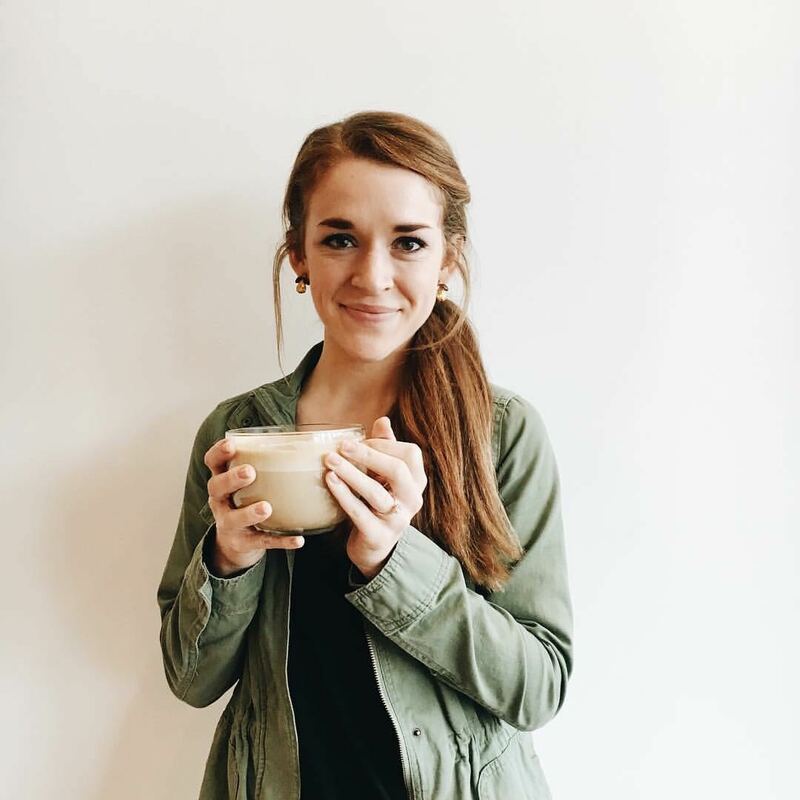 Yes, I’ve somehow made your favorite Starbucks drink into the silkiest, chocolatey pie you have ever feasted your eyes upon. I think it has the perfect blend of chocolate combined with the subtle peppermint. 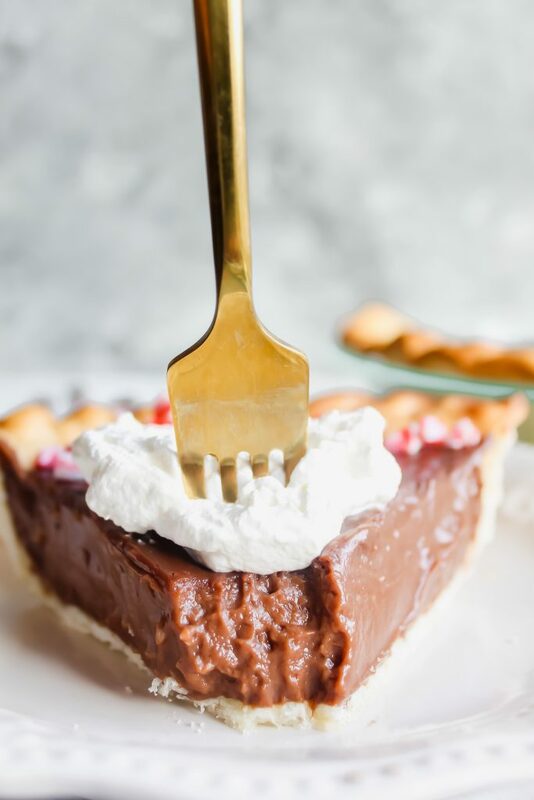 Not to mention, the espresso powder that’s deep rooted enhances the the overall flavor of this pie! I mean, if you’re making a pie based on an espresso drink, one must use espresso powder. The silky peppermint chocolate espresso filling is poured into the Wewalka pre-baked (and fully cooled!!) golden brown crust that truly holds its weight in every bite. Meaning, the crust doesn’t just crumble away each time you try to eat it. Lastly, I had to add some homemade whipped cream to just bring it up a notch in creaminess. Not to mention, does anyone ever say no to the “whip” option at Starbucks in their Peppermint Mocha? I think not! The whipped cream is refreshing and truly completes the entire pie. Okay, so, since the filling for this pie is no bake, you need to fully bake your pie crust before hand. For this, I truly recommend blind baking it! Now, believe me, I know that sounds intimidating but it’s SO easy! First, preheat your oven to 425. Next, prepare your pie crust. 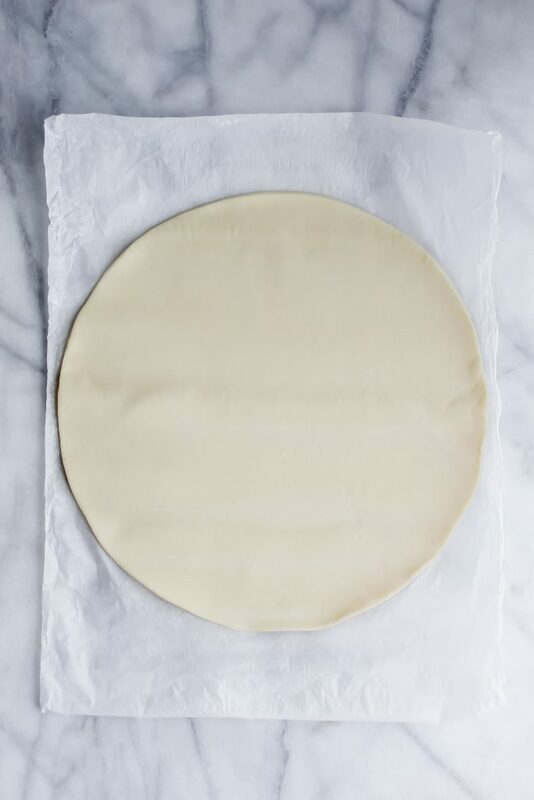 These pie crusts come with parchment paper so it makes them so easy to just place them directly over your pie pan, press down the sides and begin shaping it! I crimped my edges using this super easy tutorial from this Youtube video. Feel free to flute the crust however you’d like though! This is where it gets kinda weird, y’all. So, since there is no filling in this pie crust to weigh it down, we need something to make sure it doesn’t just puff up like a balloon in the oven. You could use pie weights (if you own any!) 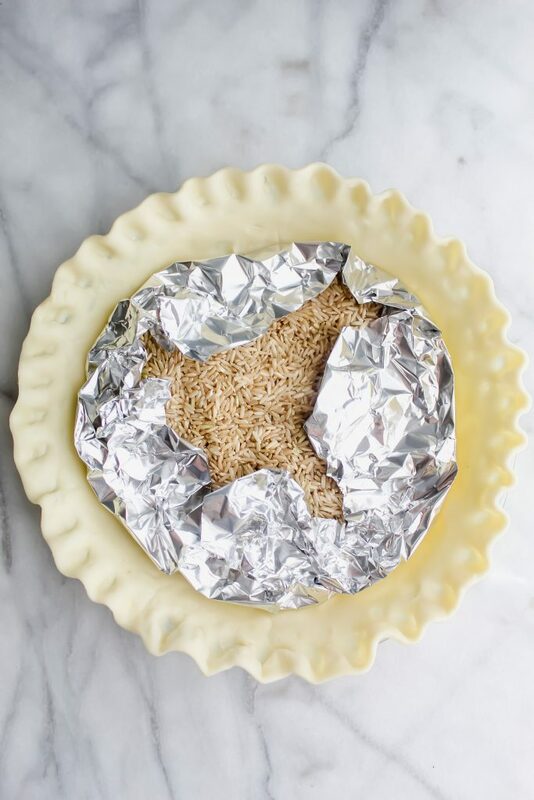 or if you’re like me – I used aluminum foil and dried rice! It weighed it down and did the job. You could also use dry beans! So, you’re going to bake the pie crust in the oven for about 12-15 minutes. When it’s light brown, take it out and CAREFULLY remove the dried rice aka don’t you burn those fingers! After that, I poked the middle of the pie generously with a fork. I placed it back in the oven for 3-5 more minutes and then it’s done! See? SO SUPER EASY. Even us non-bakers can do it! High five! In a large sauce pan, add in sugar, cornstarch and espresso powder. Whisk together to combine. Next, add in egg yolks and milk. Once again, fully incorporate. Place the pan on medium heat and begin to WHISK. Whisk and stir your life away for the next 6-10 minutes. That’s how long it’s going to take to thicken up. Once it begins to thicken, it’s going to have a pudding consistency. It will begin to bubble and boil and once it does that, immediately take it off the heat! From there, stir your chocolate, butter and peppermint extract directly into it. It will all melt into a beautiful consistency that you will most likely want to dive into. Resist the urge! Pour this mixture directly into your baked and cooled pie crust. Resist immediate consumption and let it set in the fridge for at least 4 hours or else the filling will not set and be runny. Delicious, but runny. 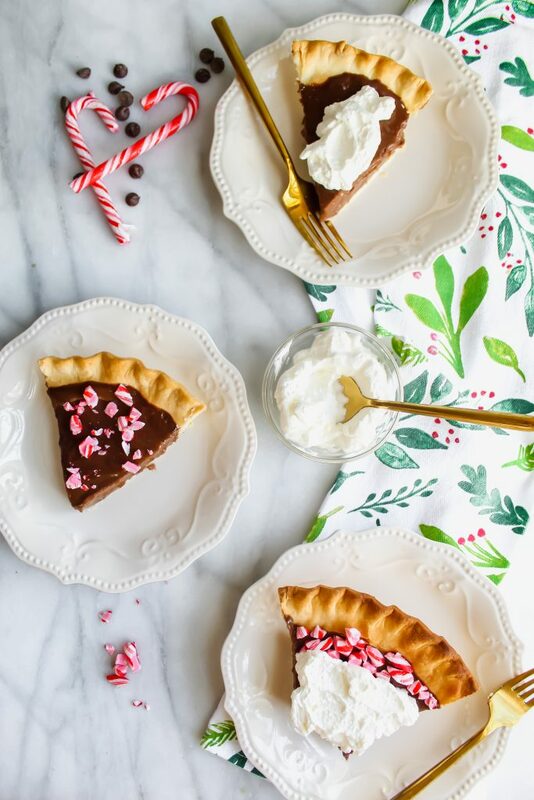 I hope you love this Peppermint Mocha Pie as much as I do. I promise it will be a hit at every holiday gathering this season! Preheat your oven to 425 degrees. 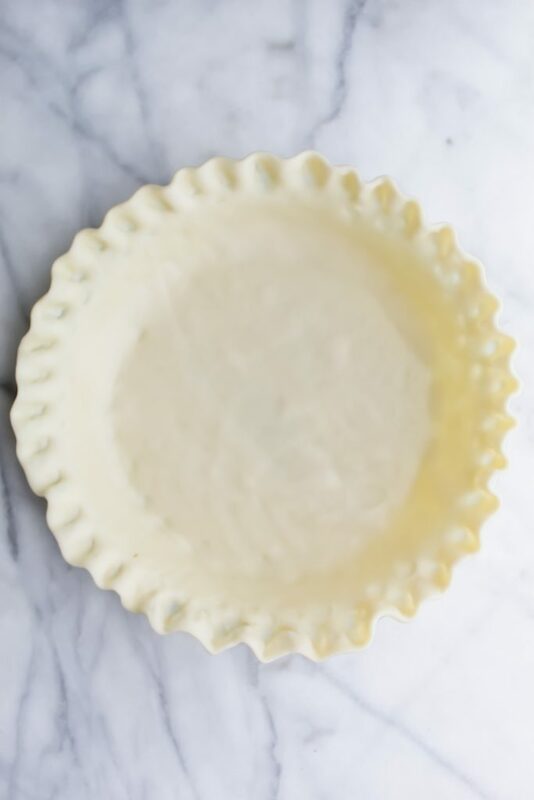 Let your pie crust sit outside of the fridge for at least 20 minutes to prevent cracking. Next, in your pie pan, press the crust down and crimp your edges. Add pie weights or dried rice in aluminum foil (see photo above in blog post) in order to help weigh the pie down. Bake the pie crust for 12-15 minutes or until pie edge is golden brown. Remove from the oven and remove the weights carefully! Continue baking for 3-5 minutes, watching carefully to make sure the edges don't burn! Let pie crust cool completely. In a large saucepan, combine your sugar, cornstarch and espresso powder. Whisk together until combined. Add in your egg yolks and milk. Combine. Place saucepan on medium heat and begin to whisk. 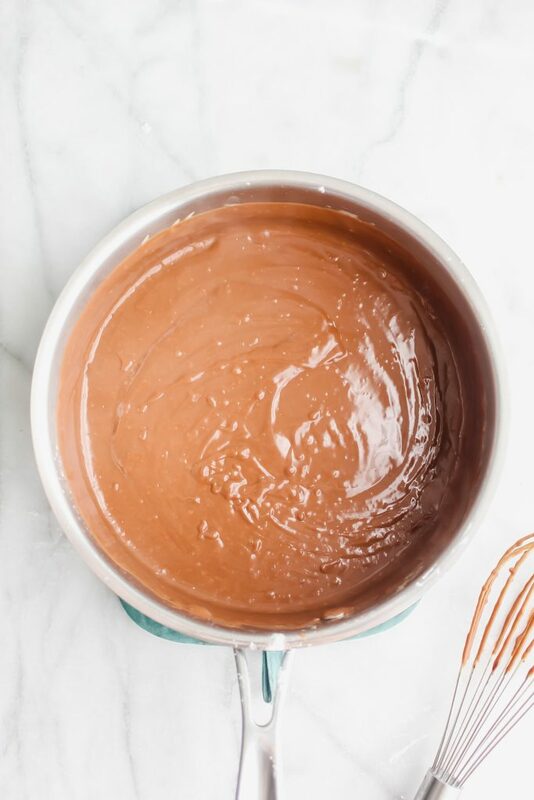 Whisk/stir continuously for 6-10 minutes until it becomes thickened like a pudding consistency. When that happens and it begins to bubble/boil, take it off the heat immediately! To the pan, immediately add your semisweet chocolate, butter and peppermint extract. 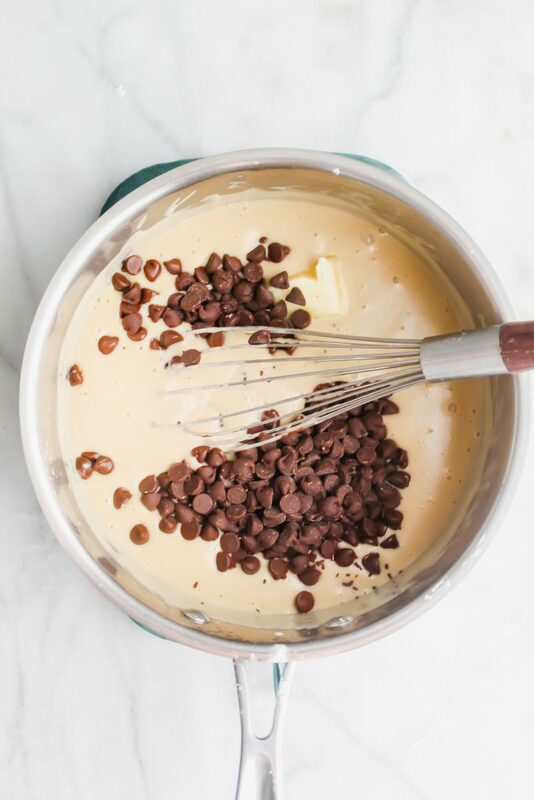 Stir together until combined and creamy. Pour this pie filling directly into the cooled baked pie crust. Let set in the refrigerator for at least 4 hours. Enjoy with whipped cream and crushed peppermints on top! Find out more on how to Blind Bake a pie crust HERE. Claire, I can totally relate! 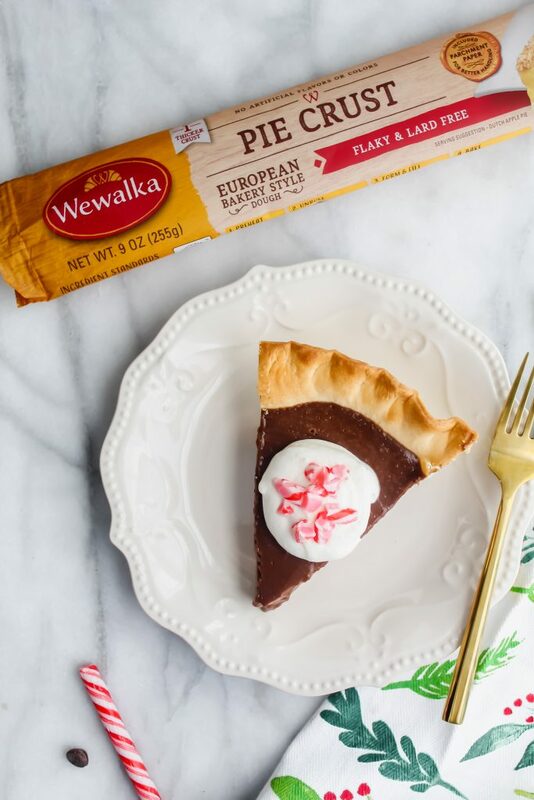 Love Wewalka’s pie crust and it’s convenience. Not to mention it’s delicious! Hope you try the pie! !